There are many items in the average home which would be perceived as valuables by the typical thief. There are some items which would be considered valuable to all criminals and not only thieves. These items can range through a variety of items, typically controlled substances and the like, but also guns. An improperly stored gun is an invitation into your home to any criminal who can potentially see it through a window. It does not have to be in plain sight, however, even a thief who simply got lucky and chose the right house may rejoice at the free gun. A stolen gun is the easiest way for a criminal to circumvent the gun registration system. There are background checks in place to prevent convicted felons from purchasing firearms. These background checks exist to keep the community and legal gun owner’s safe. A gun which is exposed to theft, regardless of whether it is in your home, at the range or even in your car, undermines this system. There are many ways that you can ensure that your firearms stay out of reach from thieves while also having them available to you at a moment's notice in case of an emergency home defense situation. The first option you have is to opt for a gun safe, but these tend to be too small to store long guns and other firearm related equipment properly. If you are looking for a solution so you can store your guns, hunting equipment, and other firearm related goods, you would be better off opting for a gun cabinet from our highly rated gun and rifle storage cabinets review. Gun cabinets (also known as security cabinets) are much larger than gun safes, but they are built to the same tough standard and feature the same quick opening locks. Before we get into our review, we will look at one of the characteristics which are most crucial for gun cabinets. It also happens to be our favorite characteristic of the particular model which we are reviewing. When choosing the best gun cabinet for your needs, the first thing you will want to account for is just how durable your cabinet is. There are several reasons why you would want to invest in a cabinet with a superior degree of durability. The first reason is that the product will simply last a longer amount of time, giving you more value for your money. You are better off investing in a gun cabinet which will last you years or even decades as opposed to a gun cabinet which will start falling apart after a few years of use. A more pressing reason, however, is that your gun cabinet needs to be tamper proof in the event of a robbery. Guns can be valuable commodities, for more reasons than just their price and you will want to keep your guns away from any tampering hands. Most gun cabinets should be very difficult if not downright impossible to destroy. 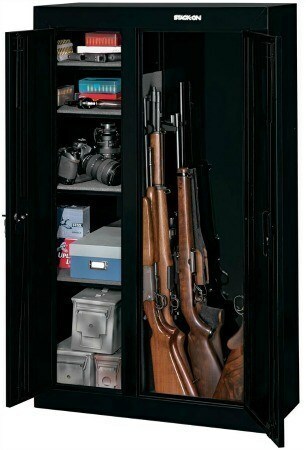 Stack-On manufactures this gun cabinet. 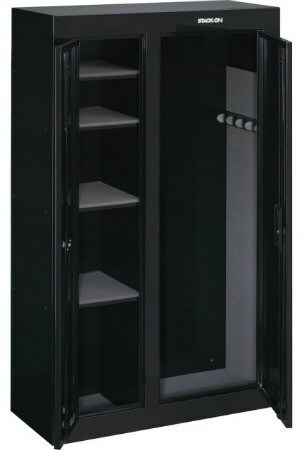 This company is one of the best manufacturers of gun safes and gun storage products in the world. Split into two separate compartments, one for your guns and the other for your accessories and ammo, this is an excellent cabinet for owners of several long guns, regardless of whether they are shotguns or rifles. Designed for the discerning customer, you will find that this gun cabinet is an excellent choice for anyone who needs a good combination of sturdy, reliable construction and convenient user friendliness. Unlike many other gun cabinets, this model has a good degree of customization, so you can set it up in the way that best suits your needs. For example, the included barrel rests may be removed and replaced depending on the number of long guns you intend to store in the gun cabinet section. Another example of this is the inclusion of removable shelves in the valuables section, allowing you to set up the ideal storage space for a wide variety of attachments, ammunition and cleaning supplies, among other things. 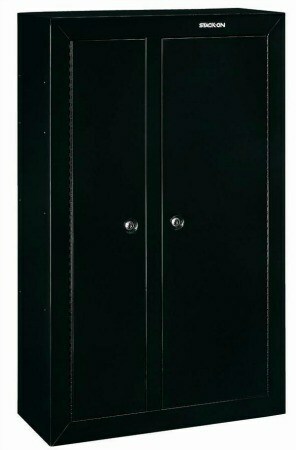 The inclusion of reinforced steel doors ensures that it is no easy task to break into this gun cabinet. You can rest assured that your collection will be safe behind these doors and the separate 3 point locks. After looking over some of the more common praise and criticism for this gun cabinet, we have compiled some of the opinions which were voiced most often. Regarding positives, most customers were impressed with just how easy this cabinet was to install and mount in their homes. Another feature which customers appreciated was the inclusion of padded interiors to keep their guns and accessories from being unintentionally scuffed or scratched. One of the downsides which were brought up quite regularly was the lack of fireproofing for this gun cabinet. If you have a large number of valuable guns that you would like to keep safe in the event of a fire, you may wish to opt for another model, but it will certainly add to the price. 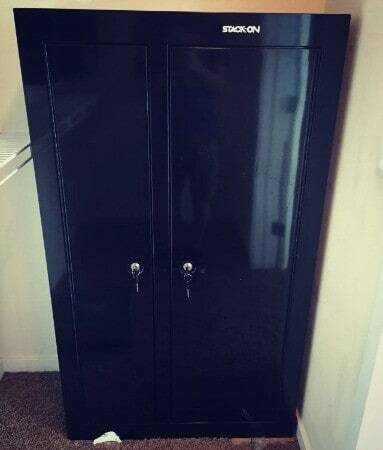 This gun cabinet model can be purchased from several online retailers, including Amazon. It's priced at around 300 dollars. Keeping your home and your guns safe is one of the most important things you can do. If you are looking for a gun safe which can withstand quite the beating yet still isn't too hard to install or unlock, this model from Stack-On is an excellent choice. If there are any questions or concerns, feel free to leave them in the comments.